Was trying to figure out where to go out for a Friday Happy Hour yesterday when J recalled our friend's rave review of Desnuda in Williamsburg. 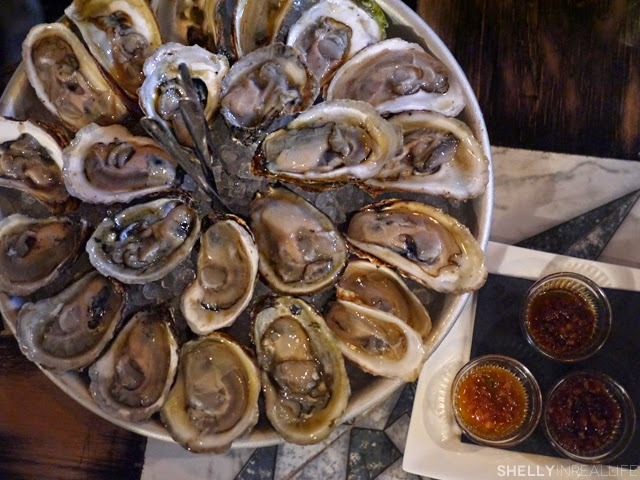 Found out that Desnuda has daily $1 Oyster specials from 6-8PM and all day Sunday and Monday. 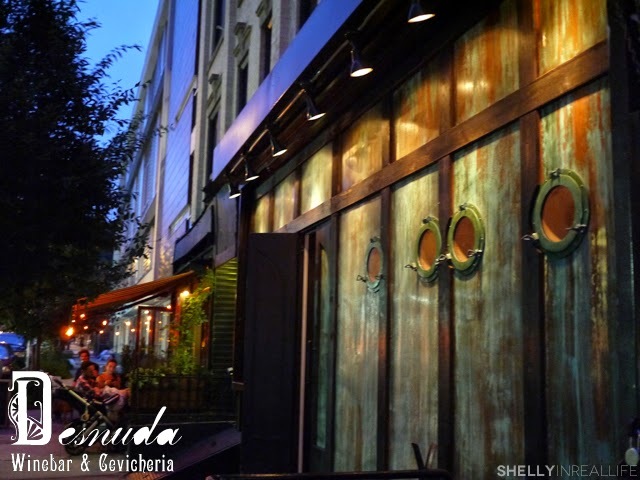 Desnuda's original location is in East Village, but their Brooklyn location is a much larger version of its Manhattan restaurant. Neatly tucked away behind an unassuming facade of distressed wooden panels with no signage, is a super cute space that's both intimate and cosy. Just what I wanted for a relaxing happy hour! Since there were only 3 of us, we sat at the bar - the booths are reserved for parties of 4 or more. The drinks here all have a Peruivan/Latin American twist to it. I became quite infatuated with the Prufrock & A Hard Place which was a pisco based drink with a super spicy twist of Devil's Tongue Chiles. I loved how smooth yet spicy the drink tasted. J had the Starring Jason Statham which was like a South American piña colada made with cachaça and amarillo. 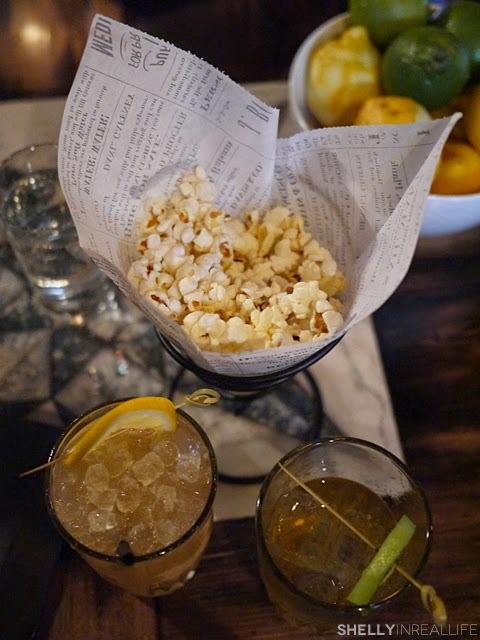 As if solid drinks, free truffle popcorn and $1 oysters weren't enough, all the other food and dishes here are immaculate as well. I know I usually set my standards for Happy Hour grub very low, but seriously, Desnuda exceeded my expectations and more. I loved that their $1 oysters came with 3 different house-made sauces: soy ginger, chipotle and tosazu sauce. My favorite was the tosazu, which is a pretty common Japanese sauce made with soy sauce, rice wine vinegar, bonito flakes, salt and sugar. However, here at Desnuda, they made it extra awesome by adding gelatin into it, so the traditional tosazu sauce became a Tosazu Jelly which totally worked with the raw oysters. Bonus points from our whole group. 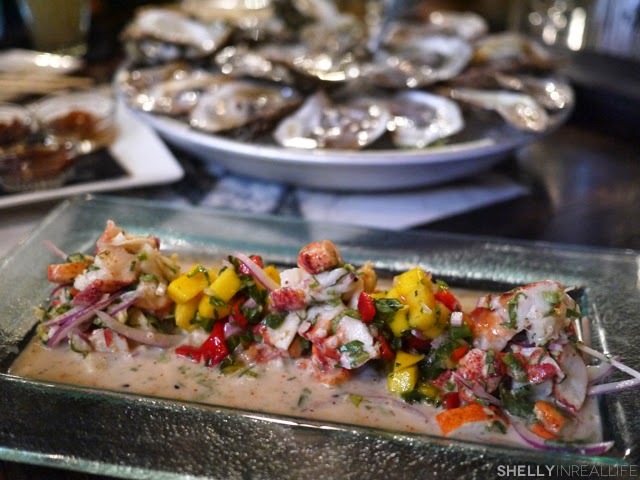 Maine Lobster (3 huge mounds of it), marinated in coconut milk, lime & orange juice, ginger & jalapeño served with a Mango Pico de Gallo in between. 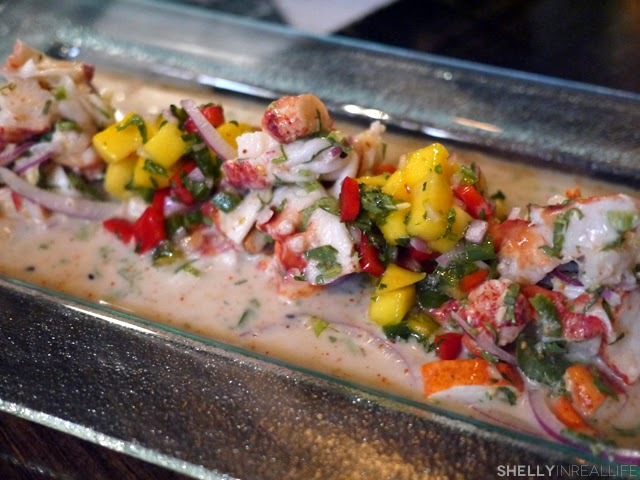 This Lobster Ceviche seriously tastes like a dream with layers and layers of flavors. The balance of heat from the peppers and soothing creaminess of the coconut milk was a party in my mouth - a fight between good and evil. The lobster was perfectly cooked, and worked really well with the sweetness of the mango. 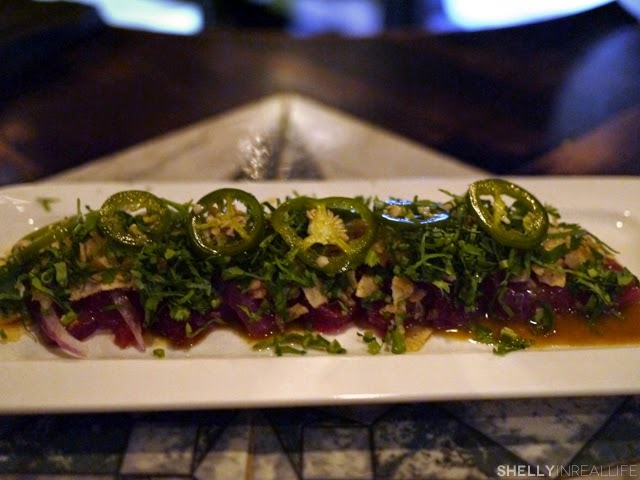 For our last two dishes, we had two types of tiraditos, a Peruvian dish of raw fish, similar to Japanese sashimi and carpaccio, in a spicy sauce. The first was the Tiradito de Atun (Tuna) - made with yellowfin tuna served with a yuzu truffle glaze and topped with jalapeño, red onion and potato chips. 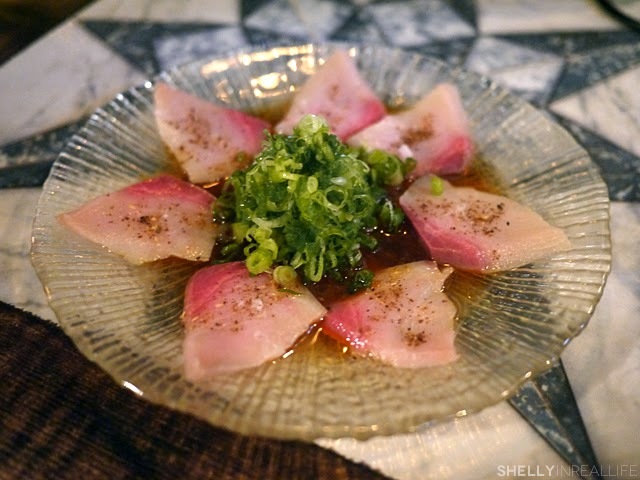 The second was their special, the Tiradito de Hamachi, topped with a szchuaen peppercorn ponzu and a ton of scallions. These two dishes were actually on the pricier side for what it was, and the quality of the fish can't match a similar Japanese restaurant in the same price range. It is interesting, however, to get a taste of this Peruvian and Japanese combo as it brought me back to my lovely memories of my meal at Maido in Lima. All in all, Desnuda really hit the spot for happy hour. 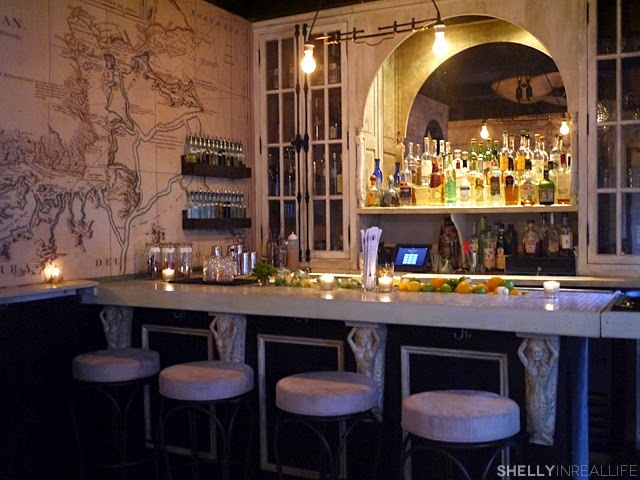 A great place to grab drinks with friends and unwind from a long week. There were tons of seats available when we got there at 6 PM right when it opened, and didn't really fill up too much for the 2 hours we were there. 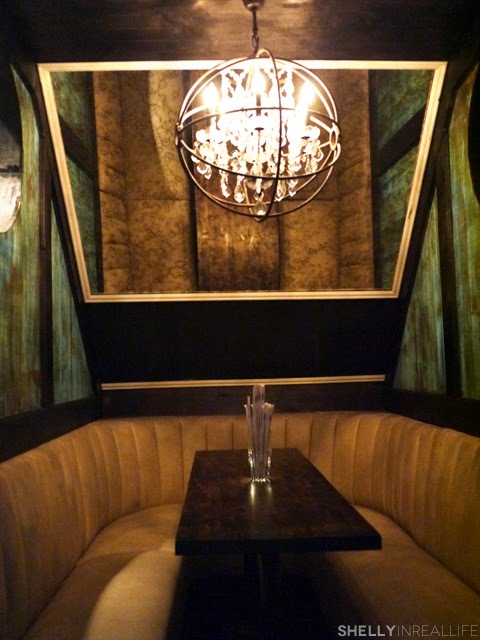 There was a huge elevated booth that sat around 16 people, with another 10-15 seats around the front bar where we sat, some extra booths in the back and another bar in the very back space (pictured below). I would definitely recommend the oysters (duh), ceviches and drinks. The tiraditos was good, but I felt like it was a TAD pricey at around ~$19 a dish. A great place to start off the night to get a few drinks and snacks.